Ever since the beginning of Donald Trump’s political career many theories have been advanced as to why he tweets so much. Some speculate it’s because the president seeks to bypass the “fake” news media and communicate directly with his social media followers. Others claim it’s due to Trump’s being a perpetually nervous control freak who can’t contain himself -- and whenever he hears something he doesn’t like he feels an impulse to reach for his device. And then there are those who swear Trump tweets habitually as part of a concocted strategy to manipulate the daily narrative and keep his name at the top of all the news feeds. After all, in the “Art of the Deal” Trump swore even bad publicity was better than none. If anyone should understand this concept it’s Donald Trump. Since Trump won the presidency there are good arguments sustaining all of these hypotheses. But what about his vanquished opponent, Hillary Clinton? The longtime Democrat maven and hard-luck loser just won’t seem to go away no matter how much conservatives – and practically everyone else – wishes she would do so. 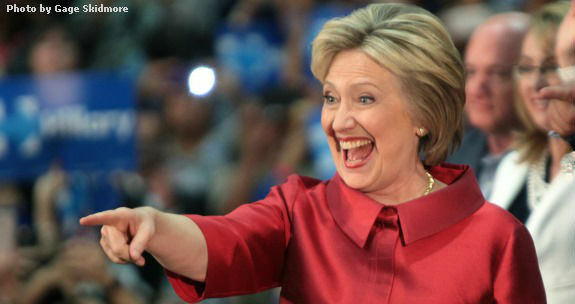 Clinton was back in the news again last week claiming the American people were never going to send her to victory. Katelyn Caralle reported last Friday in the Washington Examiner, “Failed Democratic presidential candidate Hillary Clinton said as the exit poll numbers filtered in on election night in 2016 that she knew the American people were never going to allow her to be president. “’I knew it. I knew this would happen to me.… They were never going to let me be president.,’ Amy Chozick quoted Clinton as saying in her new book Chasing Hillary: Ten Years, Two Presidential Campaigns, and One Intact Glass Ceiling, according to the Daily Beast. None of this is new and it certainly isn’t surprising either. The portrait of Clinton that’s emerged ever since the fateful November night a year and a half ago is one of a frustrated elitist who unhealthily leans on Chardonnay and long-since discredited premises to dull the agony from her successive national rejections. Chozick’s book apparently portrays Hillary as questioning why half the country just wouldn’t ever take to her. Well, when you label a quarter of your fellow citizens (meaning “half of Trump’s supporters,” which equal roughly half the voting population) as dwelling in a “basket of deplorables” it isn’t likely to ingratiate yourself with those folks. Any political expert would tell you there’s only about twenty percent of the U.S. that’s persuadable in any given election (and those numbers are shrinking rapidly in the age of Obama and Trump), so taking pot shots at people who might otherwise consider themselves open to alternatives isn’t a good strategy for winning people over. It’s no secret half of America (which certainly includes the #NeverTrumpers) wasn’t going to embrace Donald Trump either – but at least he didn’t go around insulting Democrat voters in an attempt to curry favor with his own Republicans. If your campaign consultant tells you to bash the other side’s devotees you should probably fire the guy (or gal). The “big tent” may be a myth but you still don’t want to evict anyone who could potentially be “With Her”, right? During the campaign Trump frequently announced his love of everyone (“I love African-American voters”), but he also went out of his way to say how much he admired working people, etc… In contrast, Clinton kept her distance from crowds, didn’t hold many press conferences and generally struggled to tightly control any messages streaming from headquarters. So once again Chozick’s book provides useful intelligence into understanding the mindset of not only Hillary Clinton, but of all Democrat elites. Who can forget Obama’s “cling to guns and religion” comment (from 2008) to rationalize why Americans in economically depressed areas might not accept the Democrats’ view of social liberalism and overgrown welfare state. When you think about it – to Democrats, it’s never about them; it’s always about the people themselves. If the voters don’t believe like the elites do it’s their issue, not the ruling class’s. Never mind that statistically speaking around 90 percent of black voters would never vote for Donald Trump or any Republican – but do you see GOP candidates going out and trashing African-Americans because they largely vote against the party as a group? Besides, where are all these “racist, sexist, homophobic, xenophobic, Islamophobic” people anyway? Do Democrats seriously assert a quarter of Americans sit around their Thanksgiving dinner tables and talk about how much they hate other races? Or the fact they can’t stomach having a woman lead the most powerful nation on earth? What about xenophobia (having or showing a dislike of or prejudice against people from other countries)? I’ve had many conversations centered on illegal vs. legal immigration with various folks but never heard anyone declare, “I’m against illegal immigration because I can’t stand them darn tootin’ Mexicans!” Besides, what’s wrong with having laws and obeying them? The democratic process won’t work if laws can’t (or won’t) be enforced. What if, for example, the police decided en masse to stand aside while abortion clinics were firebombed? Hillary’s “deplorables” are therefore just ill-conceived stereotypes for religious (Christians and orthodox Jews) Caucasian Americans with conservative social beliefs. Does this mean if a conservative black man (such as Ben Carson) should speak out against illegal immigration that he’s a “deplorable” too – just not a racist against himself? By any objective measure America has made great strides in becoming more accepting of people of all races, creeds, orientations and gender classifications. Jonah Goldberg wrote at National Review, “[T]hings have gotten better. In 1958, 44 percent of white Americans said they’d move if a black family moved in next door. Forty years later, that number had dropped to 1 percent. Were some whites lying? Probably, sure. But most probably weren’t. When the Civil Rights Act was passed in 1964, only 18 percent of white Americans said they had a black friend. By 1998, that number was 86 percent. Some people were probably fibbing, but the mere fact that they wanted others to believe they had a black friend is a kind of progress. “There is one sure sign that white attitudes have changed: Rates of marriage between races have been trending up for decades. In 1967, only 3 percent of newlywed marriages were interracial. The rate has risen more than fivefold, to 17 percent in 2015. Presumably, people willing to spend the rest of their lives with people of another race — never mind have children with them — aren’t lying. What other countries not only allow such newcomers to stay but also grants birthright citizenship to the illegals’ children born on sovereign soil, education to all of their offspring and often times cash payments to help families with subsistence? Heck, when you get down to it, most countries have no illegal immigration problem at all because their political entities are either so intolerant, corrupt or economically undesirable that no one would willingly desire to live there (these are the “s—thole countries”, though plenty of evidence exists that Trump never said those actual words). Ask yourself -- is anyone seriously trying to emigrate to Haiti? How about Bangladesh? Anyone want to pick up and relocate to Turkestan? Any takers? I can’t say for sure but it appears most leftist “snowflake” American protesters have probably not spent any appreciable time in places that might reveal to them how “tolerant” this country really is. Perhaps (in his upcoming meeting with NORK dictator Kim Jong-un) President Trump should try and arrange a foreign exchange student program with North Korea so the most disgruntled among us can receive a first-hand impression of how much of the other 95.6 percent of the world’s population lives. Everyone knows the government of North Korea doesn’t discriminate by race, after all – it hates, oppresses and distrusts everyone equally…including its own people. In contrast, Americans are so cognizant of looking “tolerant” they sometimes elevate marginal politicians to exalted status based on little more than skin color and gender. It’s certainly a political advantage to be a “minority” woman out in the looney left coast paradise of California. David Siders of Politico reported, “Kamala Harris has been called ‘the female Barack Obama.’ She’s built a national following with her outspoken criticism of Donald Trump and prolific fundraising for fellow Democrats. “But the California senator’s rapid rise — she’s just 15 months into her first term — has created an awkward issue: Even as progressives tout her as one of the top 2020 contenders, Harris remains something of a mystery back home. I don’t want to heap too much praise on Obama -- but he did have established name (and face) recognition in the Democrat Party prior to running for president after only a few years in the senate. In addition, Harris isn’t nearly as articulate as Obama – and really the only thing going for her is…she’s multi-racial…and a woman. Democrats tried the “first woman president” thing with Hillary Clinton in 2016. Being female simply isn’t enough of a basis to stake a candidacy. Americans might not be the most sophisticated political actors in the world, but they aren’t stupid…at least half of them, anyway.